Dr Charlie Bamforth, Distinguished Professor of Brewing Science from the University of California at Davis joins me this week to discuss malted barley, its alternatives and the huge impact malt has on beer. Dr Charlie Bamforth is Distinguished Professor of Brewing Science and Distilling at the University of California at Davis. 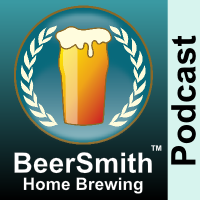 Also check out BeerSmith, BeerSmith Mobile software and the new DVDs John Palmer and I filmed – How to Brew with Malt Extract and How to Brew All Grain are available now. We discuss some of the new projects Charlie is working on including his brewing short courses. Charlie explains why good quality malt is critical in beer brewing and is not a huge expense for most larger breweries. We talk about the kilning process and how each malt house uses its own special process for creating their malted barley. Charlie shares his thoughts on how malt is critical to the flavor of beer. We discuss how even small changes in the malting process like recirculating the air used can have a large impact on the flavor of the malt. He shares how foam is critically affected by malt and also why some crystal malts may not actually be enhancing the foam/body of the beer. Charlie discusses the color derived from malt and changes that occur with heat and time. He explains how malts have both a positive and negative effect on the clarity of the finished beer. We talk about how malt affects the long term stability of the beer and also how it plays a role in staling, adding lipids and interacting with oxygen. We discuss gushing and the source of its problems – usually from fungus. We discuss alternatives to malt. Charlie shares some of his recent publications and books. Thanks to Dr Charlie Bamforth for appearing on the show and also to you for listening!